Mardi Gras, translated as Fat Tuesday from French, is a fun and festive celebration that occurs before fasting during Lent. Get the kids involved and keep them entertained by printing these free coloring pages. 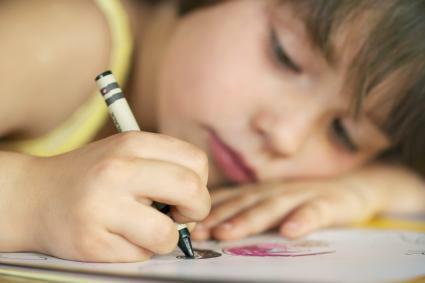 Coloring is a great way for kids to express their creativity and channel their energy. All three coloring sheets on this page are free to download using Adobe, and you can print as many copies as you'd like. Use this handy guide for working with Adobe printables if you need help. You can use regular printer paper for the jester and Mardi Gras sign coloring pages, but you may want to use card stock for the mask. This will ensure that the mask is durable enough to wear. 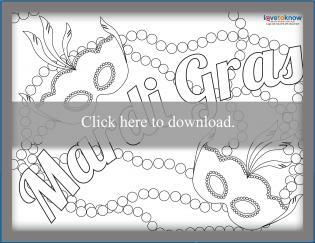 There are plenty of ways to use these printable Mardi Gras coloring pages. Print out a few of the masks and have your little one color them in. When they are done, cut out the masks, punch a hole at the top and hang them throughout their room to create an interesting, decorative corner. The masks can also be stored and used for dress up when your child is in the mood for wearing a costume. In a school or community setting, you might have kids color them of you and use them to decorate your door. You might also print them out for use in decorating a front door. Laminating these will make them last longer, and they can be reused every year. If you are having a Mardi Gras party, then printables make great decorations. You can color them and cut them out, placing them around the room. You can also create masks for your friends. The other pages can be used to explain the meaning of Mardi Gras and can be bound in a book with explanations written on the blank pages on the back of the drawings. You can also encourage your child to create freehand drawings to include in the book. Finished pages can also be framed and hung in your child's room, or in a common area to show off their artistic skills. Decorate your home for Mardi Gras using the printables. After you print them out, you can color and laminate them. Add them to your sliding glass windows or bay windows for decorations around Mardi Gras time. Do you have a little gift for a friend? You might choose to add unique coloring pages for their Mardi Gras gift. This will not only personalize your present but be fun as well. Coloring isn't just for the kids! Parents can relieve some stress around Mardi Gras and have fun by whipping out their colored pencils to color these fun pages. Have the coloring pages got you in the Mardi Gras spirit? Well don't just stop at coloring pages, there are lots of different decorations, costume ideas, and activities that you can do to celebrate this fun holiday. Add some interactive games to your Mardi Gras party. You can have karaoke, casino games, and even a murder mystery. Maybe you need some party ideas. LTK offers an array of different themes and how to set up the perfect Mardi Gras party. If your printable mask is only the beginning, then check out Mardi Gras mask ideas. This will give you step-by-step instructions on how to create a unique Mardi Gras mask that will impress your friends. Go beyond the mask to a whole Mardi Gras costume. Get step-by-step instructions for how to make the perfect Mardi Gras dress. Paper decorations might have just gotten you in the holiday spirit. If so, learn about all the different colorful decorations that you can use to make your home festive. Coloring is a great activity that keeps kids busy, engages their creativity, and encourages fine motor skill coordination. 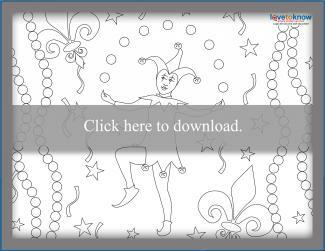 Whether you're a parent looking for a way to keep the kids entertained or you're a teacher who needs an activity for a classroom Mardi Gras party, these coloring pages will do the trick. Print them out, give the kids an assortment of crayons and markers, and let them color!